In February of 2010 I wrote Part 1of this story. Since then several members of our HOG chapter came to the same conclusion: that the ability to communicate would greatly improve the group riding experience. Four female members, including Diana, purchased the J&M handlebar mounted CB radio. Diana purchased hers used and was the third member of our chapter to own it (the two previous members were men who upgraded to CB equipped Ultra Classics). She got a good deal on it and it has worked fantastically. Some of our members purchased the J&M with the short antenna and found they had to replace it with a longer one. The only time Diana had a problem with her CB radio was when we stayed overnight in North Carolina and she didn’t put the cover on it. In the morning the condensation on it affected it’s performance for several hours before it dried out. I spent a considerable amount of time and money trying to get the unit to work well as a mobile unit powered with the 12 volt cigarette lighter plug and utilizing a base antenna. In the end I found it worked best as a handheld unit powered by batteries with the short 7″ antenna. To say it works well in comparison to the J&B or the Harley CB’s would be a lie. It works just well enough for the absolute minimum of communications but not good enough for conversation. In the end I would have to say any amount of money spent to be able to communicate is well spent. However you will get what you pay for. I initially invested $200 and subsequently another $50 or so on antenna’s and antenna mounting brackets. The system does work and for $200 I would say it is worth it. 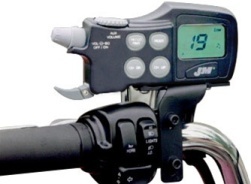 If you can afford the $600 system I would recommend you go to www.CycleAccessoryStore.com and purchase the J&B. Works well enough in the car though. Thanks Mark. Yes Rob you did comment in the original thread. Then again in another post that mentioned communications. I’m thinking you agree this is an important facet of group riding. I’m not sure why the selection of motorcycle CB is so limited. Maybe it’s like the air horn and people don’t value it. Maybe group riding isn’t as popular as a HOG member would think it is. Sorry it doesn’t come with friends. Most riders and drivers are scarey. However if you look you may be able to find a group that rides like you do. Actually Jay I think it’s because only a few Road Captains have been exposed to using CB’s. In my experience once an RC uses a radio the first time, they never want to go back. Yes, I definitely agree that once an RC uses it he wouldn’t want to go back. What about the pack riders? I think they would want to be able to communicate as well. I can’t speak for any other groups, but I know in our chapter it’s worth having “ears” on just for the entertainment value alone!!! I spend half of the rides LMAO!!! Ditto to that my friend! I bought the Midland 75-822 unit and found it to be a great product. Communications, transmission, reception and sound clarity, are outstanding. An all around great little unit. The real aggravating thing about this unit is that it comes with the mobile adapter for use in mobile applications (i.e, motorcycles). Even headsets for bike use are readily available but there is NO bike mount available that i have been able to find. Crazy! If anyone knows of a good handlebar mount for this unit that uses something more than just a steel u-bolt type of clamp please let me know. Thanks so much. The Midland 75-822 I found to be a good unit and Nady headsets which come with the 2 pin Kenwood style connector work perfectly with this radio and they’re less expensive than all the others on the market. I posted earlier about the lack of a decent handlebar mount for this unit. Just in case someout is actually interested, thete is a great one available that is perfect for it its the Ram belt clip mount perfect unit for this radio. And, oh by the way, for you guys and gals that haven’t had good reception with this unit it could very well be because you.are not using the.right.antenna. You MUST use a No Groung Plane (NGP) antenna and br certain you install it exactly per the.instructions. If you still get bad reception send the unit for repair. I have been able to communicate with others.on this unit over.distances of 8-10 miles.